Home / Life at the Manor / Life is very busy. The Best Mother Ever is here, drastic house stuff is going on that includes unpacking boxes that have been packed for years (on the plus side, I found Tink’s wardrobe!) and the resurfacing of the bathroom floor to repair Emmaline’s depredations, we are also installing full range of warmup products that we picked from atlasceramics.co.uk. Thus the lack of posting, as I try to juggle work, school, and drastic house stuff! So instead of a substantive post, here. 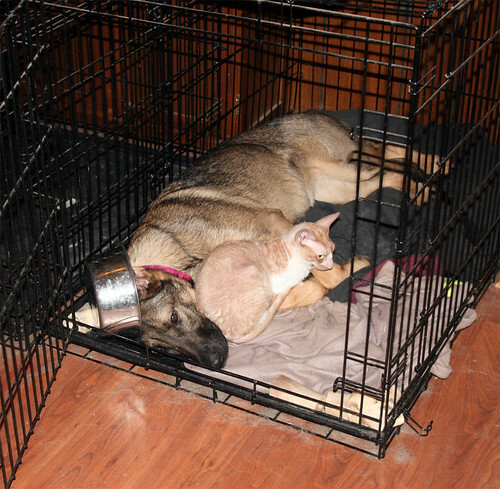 Have Zille in Beowulf’s crate, wearing a foodbowl for a hat while she snuggles Rooney Lee.